A jaunt through Tehran, Esfahan and Persepolis. The joke was barely out of my mouth before I regretted making it. A thousand thoughts exploded in my head, none of them comforting. But it turned out the man only wanted to walk around the corner for a little privacy so he could ask about getting a visa to come to America. It was a most unexpected welcome to Iran — but not, as it turned out, all that unusual. During the month I spent there one fall not too long ago I had similar exchanges with Iranians from all walks of life, few of them interested in discussing the animosity that has existed for so long between our two governments. Nobody burned an American flag in my presence. Nobody threw rocks or taunted me. Many, in fact, expressed embarrassment over the takeover of the U.S. embassy in Tehran in 1979, when 52 Americans were held captive for 444 days. And rarely did average Iranians air their grievances with the United States, of which there are many: the CIA-backed coup in 1953 that overthrew a democratically elected prime minister; the decades of U.S. support for the unpopular Shah; the help given to Saddam Hussein during his eight-year war against Iran; and the shooting down of an Iranian airliner over the Persian Gulf in 1988, killing all 260 people aboard. The United States says it was a horrible accident; the Iranian government maintains it was deliberate. Understandably, though, most Americans are reluctant to travel to an “axis of evil,” as Bush calls it. But it’s perfectly legal to do so. Unlike Cuba, where U.S. law makes it virtually impossible for its citizens to set foot, Iran can be visited by any American who can get a visa (which, admittedly, is not always easy to do). And there are plenty of reasons to go. In 2005, UNESCO ranked Iran seventh in the world in terms of historical, natural and archaeological assets. There’s world-class diving in the coral-rich Persian Gulf; skiing and mountain trekking take place amid peaks over 18,000 feet. But visitors don’t have to worry about jostling crowds: Iran ranks only 70th in the world in tourism revenue, which means not many are coming. As an Iranian American growing up in Marin during the 1980s, I was constantly confronted with images of Iranians that never matched my perceptions or the experiences of people I knew so well. From an early age, I wanted to go to Iran and get to know it for myself, beyond both the U.S. propaganda and the often-distorted nostalgia of Iranian expats living in America. Arriving in Tehran, it’s hard to imagine there would be much worth staying to visit. The smog hangs over the city so thickly it has a texture. The city streets often resemble a parking lot. Many of its old architectural gems were destroyed by the Shah and replaced by drab, modern buildings, many now cheerlessly adorned with billboards honoring martyrs from Iran’s war with Iraq. Tehran, one quickly discovers, is a little rough around the edges. Something about it, though, kept me transfixed. Tehran’s charm doesn’t lie in prettiness but in its surprises. For a city of its size (somewhere between 12 million and 15 million; no one is really sure) Tehran is improbably warm and friendly. Since the streets are packed, many Tehranis opt to take taxis. Unless the passenger is ready to pay for the whole cab and clearly states so, the driver will pick up as many passengers as the car will hold. This is a great way to see Tehran and get to know its residents. Any official gender segregation goes completely unnoticed, and men and women from all social strata discuss everything from government corruption to American pop music to computers to ever-rising inflation. I speak a little Persian, but it’s not essential for a visit; many Iranians, especially the younger ones, speak English. One afternoon, to escape the smog, I hailed one of these communal cabs and headed for the top of Tehran, to one of the Shah’s former palaces. As I made my way through the entrance of the Sa’ad Abad Museum Complex, I felt I was in another world. The grounds were covered in lush, mature trees that appeared to be well manicured. On the ample lawns that surround the regal buildings, couples of all ages sat and flirted, making sure not to do anything too risqué. It was clear from the literature provided at the door and from the bored and scruffy-looking guards — who were all too willing to give a guided tour of the artifacts of monarchial excess — that this museum was meant to show the evils of the Shah’s reign. The effect, though, was of a wistful nostalgia on the part of every visitor I saw, most of them ogling the large Persian rugs (the likes of which have all but vanished from Iran into the collections of Westerners) while the elders recounted the Iranian achievements of that era. Iran, I realized, is a nation fixated on what could have been. Returning to reality — and to the smog — I made my way back to Tajrish, a bustling, upscale neighborhood in the north of the city, where I was approached by a women shrouded completely in black, a rare sight in that more liberal part of Tehran. “Are you going to Vanak Square?” she asked. I told her I was, but that I wasn’t a driver. One of the few female taxi drivers in Tehran, she took us on shortcuts through residential neighborhoods and drove as if she would know them with her eyes closed. With every pothole we hit, she cursed the inefficiencies of the regime, to the delight of the five of us who were her fares. For visitors from the West, the role of women here is an eye-opener. Sixty percent of university students are female. Women now hold many of the traditionally male jobs and are a conspicuous and beautiful part of Iranian public life. Compare these numbers with U.S. allies such as Saudi Arabia, and it leads to head-scratching. And as I learned that night, they can most certainly drive cars. One site in Tehran is far more fascinating to visiting Americans than it is to most Iranians: The old U.S. embassy, site of the 1979 student takeover that so badly soured relations between the two nations. It’s an imposing site, taking up several city blocks in central Tehran, and it’s surrounded by a huge brick wall. The walls are covered with anti-American and anti-Israeli murals and quotes from Ayatollah Khomeini. Above the wall is barbed wire. These days, much of the grounds are used as a headquarters for a military group, while the main building is an anti-imperialism museum open only a few days a year. A couple of rooms are dedicated to depicting American operations within the “Den of Spies,” as the Iranians once called the embassy. Other exhibits honor the students who took over the embassy and spent weeks painstakingly piecing together shredded U.S. documents. 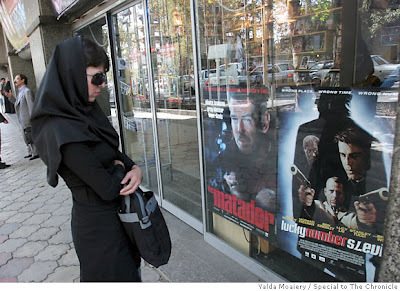 Photo exhibits depict atrocities perpetrated on Iran and other developing nations. I happened to be in Tehran on one of the few days the museum was open. When I asked a taxi driver to take me to the “old American Embassy,” his response surprised me: “Old American Embassy? There’s only one American Embassy, which is the property of the U.S.” He went into a long diatribe about how international law was broken when the embassy was seized. For most Iranians, the embassy takeover was clearly not their proudest moment. When I arrived, groups of schoolchildren were being led around and quizzed about Western atrocities against Muslims. After I made it clear to everyone there that I was American, the scene quickly changed to one of curiosity and friendliness. “What’s new in Hollywood?” asked one of the students in a hushed voice. Young Iranians are more informed about American pop culture than I’ll ever be, but as far as American political history goes, they seemed uninterested. If Tehran is an acquired taste, Esfahan is an epiphany. Travelers returning from Iran have for centuries boasted of the “Persian Florence.” Visiting the blue, mosaic-tiled mosques that help quench the desert’s ravenous thirst for civilization, though, I had to question that comparison. Both towns rose to glory during the same era, but it was Esfahan, not its unofficial European sister city, that was Earth’s most populous capital. Behind every corner I stumbled upon spectacular reminders of that rich past. The city was built around the river Zayandeh Rood, which is crossed by two of the world’s most picturesque pedestrian bridges. The first is Si-o-Se Pol, literally “Thirty Three Bridge,” named for its 33 arches. The second, the Khaju bridge built by Shah Abbas in 1650, has two stories and features stone stairs that descend to the river. It’s probably the best place in Iran to dip your feet on a hot day. A popular Persian rhyme of the day that “Esfahan is half the world” gave Esfahan’s square its original name. Indeed, the square has been the heart of the city since it was built in 1612, flanked by some of the most important buildings of the Islamic world and a labyrinthine bazaar that still serves as the center of commerce. Esfahan continues to be Iran’s most religiously diverse city, with a number of churches, Zoroastrian temples — and, yes, synagogues. This comes as a big surprise amid all the anti-Zionist rhetoric, but Iran is home to more Jews — about 30,000 — than any other Middle Eastern nation, other than Israel. In a country known for its devotion to religious icons and martyrs, for me Esfahan itself was the ultimate pilgrimage. Stepping even further back in time, I visited the ruins of Persepolis, south of Esfahan — the ancient Persian city constructed by Darius the Great, beginning in 512 B.C. What remains today is a series of bas-reliefs with intricately carved characters that include brigades of soldiers and mythical figures such as the winged Homa, which predates Islam by many centuries but remains a symbol of Persian pride. Buried under sand until the 1930s, when it was excavated, the remains only hint at the grandeur of this desert palace. Darius’ father-in-law, Cyrus, was the founder of Persia and the first architect of a human rights declaration. During his reign the Persian Empire spread to become the largest nation the world had yet seen. The construction of Persepolis took nearly 150 years, and the city’s glory was short-lived. Alexander the Great’s army burned the city to the ground in 330 B.C. Wandering the ruins early in the morning, I thought about how Persepolis represented Iran’s first what-could-have-been moment, and how it is facing another fork in the road right now. Based on the warm welcome the people here gave to a citizen of their ostensible enemy, I left full of hope. Jason Rezaian, director of Iran Media Services, is a guide to journalists visiting Iran.